Today we made our way to the library, and other than my gps regularly attempting to get me lost (it has some issues with streets that it claims are through streets which I can clearly see are not), it went really well. When we got there it even turned out to be story time day so we now know when to show up for that if we chose to make it part of our week (hopefully I'll eventually learn to get there without having to back track and turn around over and over again). We actually found a good new book, which is rare, or at least had been in our old library where it seemed that if it was worth reading, we'd checked it out at least a dozen times. 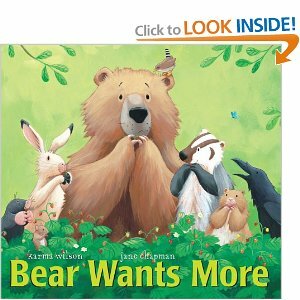 Today's find was Bear Wants More by Karma Wilson and illustrated by Jane Chapman. It's a clever, rhyming story about a bear who wakes up from his winter nap and can't seem to get full. His friends guide him to a variety of food sources (though I couldn't help thinking that in real life he'd probably eat said friends) and even throw him a party in an attempt to appease his hunger. The illustrations are cute but not cartoonish and the repeated line of "the bear wants more. . . " is fun for kids to repeat. I'm planning to put it on my amazon wish list for Coryn as well as read it over and over again until we have to take it back.